The current downturn in oil prices has thrown our industry into a difficult series of deep cost-cutting exercises to maintain cash flow without sacrificing the future. While this is not our first rodeo, this time we must supplement our efforts with an approach described below to enable us to go “lower for longer.” Not surprisingly, attempts have been made to leverage the billions of dollars spent on information and communications technologies to help improve efficiency and productivity. Unfortunately, their use in Integrated Operations (Digital Oil Field) programs is not delivering the promised benefits on a wide-scale basis. So, how do we leverage our technology assets to immediately respond to the current state? The path forward is not scientific or operational. The answer is anthropological. We define Industrial Anthropology as the study of human behaviors of employees, service providers and customers of an organization, and the elements and environment that impact people. Our global oil industry is predominantly an engineering community. Our skill-set lends itself to understanding the technical root causes of our challenges; equipment failures, blow-outs, accidents, etc. But as engineers and scientists who concentrate on the tangible, we are not as well equipped to develop the less technical, intangible solutions and approaches required to influence mindsets. It matters because we continue to overlook the critical human element. Less than 1% of the terabytes of data that we continuously collect from our operations is used. This is not because the data is bad or the tools are not user friendly, or that we don’t have data scientists who can interpret the numbers. Rather, it largely sits collecting cyber-dust because the people (field and office) choose not to fully exploit it. And the biggest offenders are the dedicated and experienced personnel that are the walking repositories of our deep domain knowledge. Are they then the problem? Not a chance. They are actually the solution. So how do we achieve the next level of “lower for longer” to get the most out of what is left? Note: Some organizations have cut to the core and anything further could jeopardize sustainability. But we must also proceed cautiously given that we have created an environment of workplace instability and uncertainty, causing a deeper trust chasm between the companies and their personnel. The optimal integration of business processes and advanced technologies, supported by organizational alignment, to deliver a new standard for decision making in a collaborative cultural environment. The emphasis in this definition was on the “technical” to then be propped up by the “softer or human” elements that would drive better decisions to achieve value. The focus here is on breaking down the functional, organizational barriers, and in turn leveraging the human assets, not the technical assets, to drive value. In other words, successful Integrated Operations requires an anthropological focus to drive better efficiencies and decisions across assets. Finally, we flip the approach. The industry’s standard way of chasing value has been to reach for smart technologies, build operations centers, implement data acquisition tools and deploy dashboards. We’ve done these things as part of centrally “mandated” programs and with the “help” of service providers who have never worn a pair of steel-toed boots as part of their daily work uniform. The traditional process generally follows a particular path that yields questionable results. The New Integrated Operations Approach begins with a predominantly field employee-driven program (those who spend and make the money for the company), backed by executive support and support staff. Capabilities needed within each asset must be defined to survive the downturn while protecting the future. 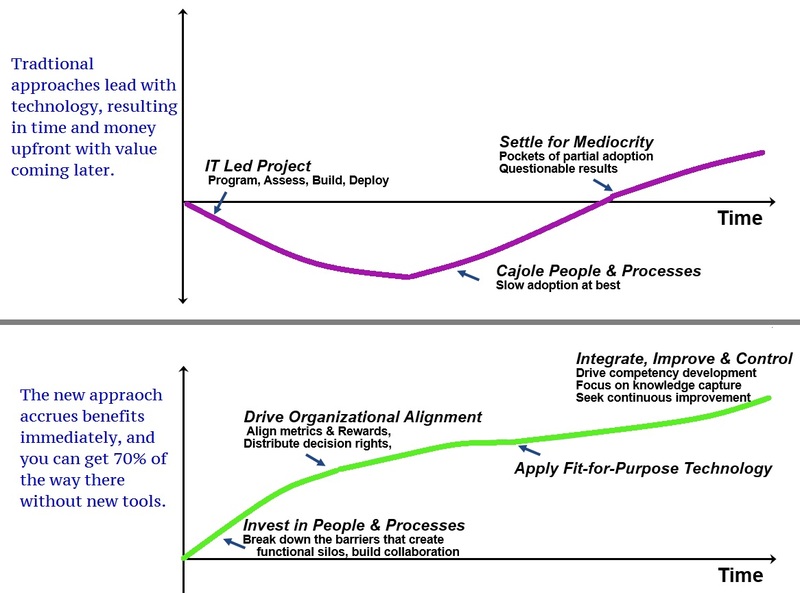 The process evolves to include technology solutions later in the cycle. Benefits accrue immediately and sustainably, and provide the momentum for increased value over time. When provided with the proper leadership support and the opportunity, cross-functional teams of field personnel will develop an integrated asset management solution that is optimal for their business. They find innovative ways to improve day-to-day drilling and production operations, from field development planning to reserves recovery to surface facility management. When appropriate, they will collaborate with oil field service providers to assist in evaluating and executing solutions to enhance production and drive cost efficiencies. A critical success factor is for their efforts to be met with the organizational support that ensures the management structure is in place to reward results, not just efforts. Following the non-traditional approach outlined above, and applying our proven methodologies and frameworks, we have demonstrated repeatedly the hard economic value of focusing on the People aspect of an Integrated Operations “People, Process, Technology” transformation. As an example, one of our most difficult assignments involved an under-producing heavy oil field with favorable OOIP and an unfavorable recovery factor. The production engineers were under pressure to increase production to meet plan, but were faced with several challenges associated with difficult well dynamics. This was complicated by the fact that they (the production engineers) were in fierce competition for constrained resources and they were considered less strategic to the overall production outlook of the asset. As a result, there was considerable friction across functions. When called in to consult, we quickly recognized their primary barrier was not technical but organizational. We assisted in launching an Integrated Operations program that was kicked-off with a three-day workshop where various functions were brought together to truly collaborate (open and honestly). Several of the exercises were designed to address the organizational challenges and to break down the barriers to communication. The participants came to a consensus to adopt an integrated asset management philosophy and laid the groundwork for a new way of working. They even went as far as establishing aggressive goals and the KPIs to match. Following the workshop and using what they had learned, the new integrated team set-up a make-shift collaboration room within which they devised new processes, communication protocols, and most importantly, established a new decision architecture. Under a new field development plan, production output was tripled 10 months ahead of schedule (with management of an acceptable 10% decline rate). The annual economic value (at today’s oil prices) of the improved asset was approximately $200 million. It is important to note that this was all achieved without any investment into new information technology solutions. Once the barriers between functional silos were taken down, the teams began to leverage existing tools the organization had already purchased to ease information sharing and enhance integrated decisions. However, the strongest testament to their success was the adoption of their philosophy by other field management teams and neighboring assets. 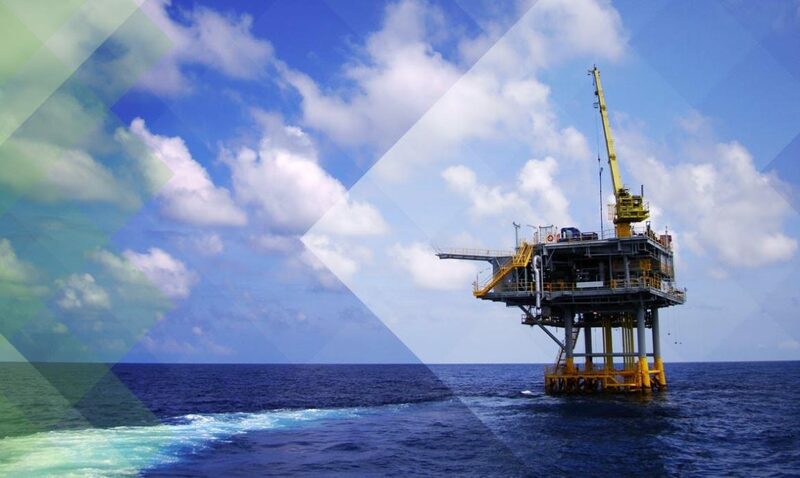 In today’s low oil price environment, controlling costs and making the most out of our existing resources is critical to surviving, especially since there is significant uncertainty around the duration of the current downturn. To achieve the next level of “lower for longer” our only choice is to take a different approach to developing advanced capabilities, improving processes and leveraging technology. If we are bold enough to shed our sturdy engineering armor and apply more anthropological solutions, we can finally make more effective inroads to improved operability and integrity for higher production and reduced OPEX.